Information Design Tool (IDT) is a metadata design environment that enables a designer to extract, define, and manipulate metadata from relational and OLAP sources to create and deploy Business Objects universes. Below are the Resources for Information Design Tool (IDT). These resources are must to start you IDT. 3. Make the connection to Shortcut (secured connection when exported to Repository). 5. Business Layer (it’s nothing but Classes and objects in Universe designer). 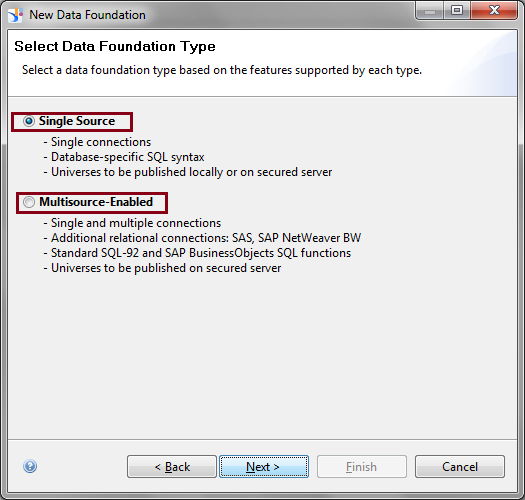 We can use single or multi source connection to create universe and below are the features of using single / multiple data sources. Data Foundation will be able to access multiple Connections (Multiple Data sources). We will be able to create a universe that contains tables from multiple data sources. Meaning you can create a single universe to import tables from Oracle, MS Access and SQL Server. Before BI 4.0 version, universe consists of a single .unv file and attached to a database connection, stored in the System Database. In 4.0, the universe will consist of three distinct components, each stored as a separate file. 1. Connection file (.cnx) – Connection Details to the data source. 2. Data Foundation file (.dfx) – Nothing but universe structure, such as tables, joins, contexts, etc. 3. Business Layer file (.blx) – Nothing but classes and objects used to access the data. Above 3 files together brought to single .unx files which will be your universe. You can also able to create multiple business layers on single Data foundation and create a universe structure once and share them in across multiple universes. We can eliminate linked universes drawbacks (No Customer LOVs) by creating one master data foundation and build your universe on top that data foundation. IDT will have the ability to create LOVs in the Data Foundation layer and those LOVs can be shared across multiple universes and use it as many as universe. It reduces lots of your development time. 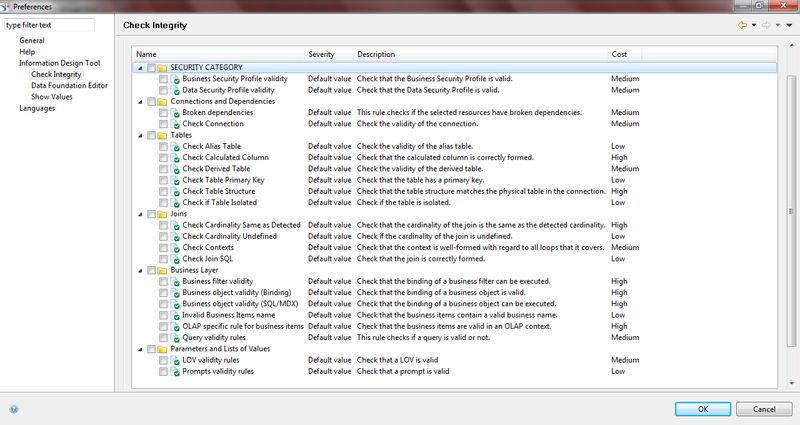 Lists of Values are also created as standalone objects. We have the added ability to hide columns, delete columns, or rename columns. Also, you can create a LOV and enter the values. Once the LOV is created, that can be associated to an objector a prompt. There is good search feature in BI 4.0 to help you to find the required information as you wanted. You can do search based on Table Name, Column Name, Context and Family (nothing but creating a group of tables under single umbrella). You can also use wild cards for your search criteria. Another useful feature is data viewing in universe. Currently you can view data at table level or select particular column to show values. In BI 4.0 you can select multiple columns (if they are joined) and see the values which will help to do better design of your universe. This way you can reduce some of your testing time. Even when viewing the data, you can add filters, just like query filters in Web Intelligence, including wild card filters. You can reorder the columns, apply sorts to the columns, and, also can view the data as a chart. Queries can be defined in Business layer and Saved for future use. This can be used to test your objects data and business layers elements (object Result). This is same as Query panel in Universe designer to test your object and here you can save the tested query and use for future reference which will reduce lots testing effort in your universe design process. Contexts got major changes in BI 4.0 and made them very simple in the universe design. In 4.0, only the joins that are part of a loop need to be in contexts and all other joins will be equally accessible to all contexts whereas in earlier versions, each join should be part of at least any one of the context except shortcut joins. The Integrity Check has more capabilities where we can have the ability to create our own rules which is available in Plug-ins and you can set the priority for each rule you are creating. Another good think you make the Integrity Check to run in background so that you can continue your job without getting disturbed. Once the check is completed you can keep the record what we need to change. Derived table concept is a wonderful future in Universe designer and it got even better in BI 4.0. If you want to create a derived table based on 2 tables making them union, now you select both tables and create Derived table and you can edit the SQL in the derived table using the standard SQL editor. Alias table also has the similar feature like derived table. You can multi-select a group of tables, and then create Aliases of all of them in one step. One of the new features available in IDT is something called Families and a family is a group of related tables having said you can create a family based on related tables together, export the families, and import families. For example, you can make a Family based on Customer which includes all the tables related to customer. Families have the ability to do color coding for easy identification in the Data Foundation. These Colors can be added to the fonts (table names), as well as the table background. Families can be used in search also. Prompts will now be standalone objects and they can be shared between universes and objects. We have ability to create optional prompts in the universe. Another special option is, we can create @prompt objects based on prompt editor and you can select the data whatever you want without typing and missing something. IDT introduced the concept of Dependencies and Impact Analysis. This will allow you to see what layers are related to other layers. You can check the impact elements all the way down to the database tables (columns). If you make any change to a table in the Data Foundation, you will be able to find what Business Layers and Universes will be impacted by this change. But you won’t be able to see what reports will be impacted by modifying an object. Predefined/Conditional Filters can be created by writing SQL and we have the ability to create them using the Query Panel. Create the query filters you want, and then save them as a Predefined/Conditional Filter. These filters can be reused like prompts objects. In 4.0 IDT, we can run queries, save the queries, apply filters, sort the results, hide columns in the results, display the results as charts, and, in the future, make these queries available to the BI tools. Comments can be added in the Data Foundation and you can make them colorful in IDT. Comments would have border, background and font colors. Also have the ability to make the comments misty. Calculated Columns is another new feature in IDT. It has the ability to add columns to tables in the Data Foundation. For example, Calculated Columns can be added in to a table which calculates Forecast Sales (Quantity * Sales Amount per Branch). Once you have added the calculated column into the table, it can be used like other column from that table. Calculated Column will have different identification in the table and will display the calculation when you move the mouse over the column. Universe Views – Once you build the universe, you can create a view of that universe as a separate object and you can select which folders and objects to expose in the view. Then you can set security on the views to decide who gets to see those folders and objects. This feature would completely destroy the need of linked universes and all their drawbacks. • Create a universe in your source language using IDT. • Translate the metadata in the Data Foundation and Business Layer using the Translation Management Tool. • You can create reports from the same universe that can be displayed in several languages based on user preferences. 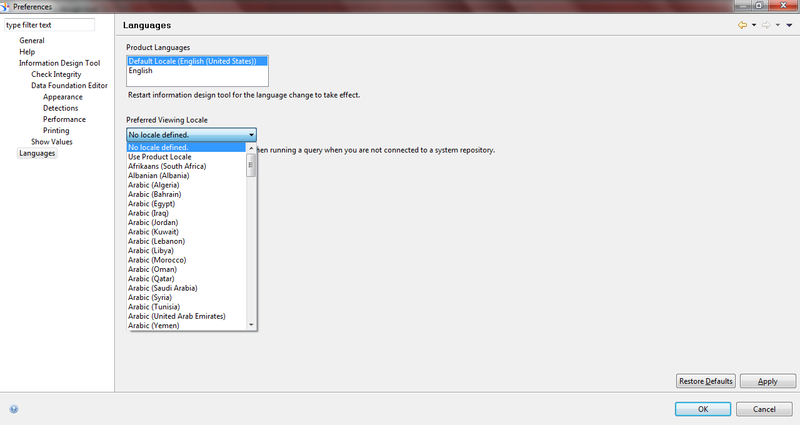 Below are the 3 language parameters impact how labels, metadata, and data are displayed in the IDT. Note 1: Share resources to allow multiple designers to work on the same resources concurrently. Note 2: Business Layer is a collection of metadata objects that map to SQL or MDX definitions in a database. Note 3: Multidimensional Expressions (MDX) is a querying language for OLAP.